Conditioning is one of the most complex aspects to get a full grip of when training for sport and when learning from the coach’s perspective on hockey specific strength and conditioning. 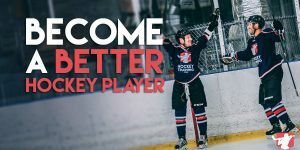 Dan has recently written a complete guide on hockey conditioning that you can read here: Hockey Conditioning Training Guide. There are so many underlying mechanisms to performance enhancement and especially hockey specific conditioning that many coaches either feel too intimidated to take on, or simply it flies right over their head going undetected due mainly to the fact that they feel “cardio” work will get their athletes conditioned. This is not the case, especially since most coaches and athletes refer “cardio” just as their aerobic base while jogging or doing countless laps around the ice. That is a basic example of a proper hockey conditioning workout, although those exercises aren’t set in stone. The replacements are endless with the number of variations you can do once you understand the principles of hockey conditioning programming. Over time to increase your work capacity as I discussed above, you would simply either increase the amount of work done within those parameters or decrease your rest period. These are the easiest ways in which you can measurably progress your training throughout your phases to guarantee you are making progress and not just shooting in the dark. *A, B, C represent supersets. Example – Perform A1, rest 10 seconds, perform A2, rest 45 seconds and repeat for 4 rounds or sets. What Is Being Conditioned For Hockey? Whenever you are designing a sport conditioning program, you have to consider the specificity of the conditioning effect you are trying to create, because there is no such thing as saying someone is “conditioned” without first providing context. You can pretty much guarantee nearly everybody is going to just automatically say that the marathon runner is just because for some reason it has been burned into the industry that conditioning only equals your ability to do low-intensity steady state work for extended periods of time. This is not the case and is not the context of the case either. A powerlifter is by no means conditioned to run marathons in his spare time, but, a marathon runner is also in no way conditioned to do what a powerlifter does either. They have completely different muscle fiber type and energy system use during their sport demands. Apples and oranges, comparing them under the same criteria of “who is more conditioned” holds no meaning in real program design. This is why the physiological assessment of the sport in question becomes extremely important. • What is the dominant energy system(s) being used in competition here? • What other energy systems are involved that are also important and supporting performance? • How can we maximally replicate the demands of the sport through conditioning programming so that it has the greatest carryover to the game? • What is going on at the cellular level that can be improved to better enhance athletic conditioning and work capacity? A runner, triathlete, football player, swimmer, fighter, powerlifter, and hockey player may all be very well conditioned – but the context of conditioning for their sports are entirely different, and the term conditioning means something different to each and every one of them. You have to understand your sport and prepare yourself adequately for it. This is what real training is. Training is a structured program and periodization system designed to achieve a desired goal or result. Whereas exercising is just burning calories with no aim or measurable indicators to improve performance in a given task or sport. One of them is just moving, the other one is moving with intent. To become a better hockey player you need to train, and training is done by understanding and replicating the demands of the game from all angles of physiology. Here’s another example to drive this point home; there is a reason that Usain Bolt isn’t also the 400m and 800m gold medalist. Different energy systems, different training requirements, different competition, and different definitions of conditioning. You can’t be dominant everywhere and you can’t be “conditioned” to do everything – it doesn’t work that way. You need to first understand your sport, and then condition yourself accordingly for that specific demand. When hockey players are doing their conditioning workouts, so many of them are overemphasizing very long duration and slow pace jogs and/or doing far too many slow laps around the ice. When do you ever do this in a game? Some hockey players entire conditioning system consists of going for 5 – 10km steady state runs around their neighborhood. Why are you training like a cross country runner? Hockey is an alactic-aerobic sport from an energy system perspective. This means it involves short, high-intensity, high-power output bursts coupled with low-intensity intervals of easier movement. An example of this would be skating as fast as you can towards the net, unloading a big slap shot and scoring a goal – followed up by a slow skate back to center ice to re-start the game. High-intensity movement, and then low-intensity movement. Think about the game of hockey, the parts of the game that matter most are played with explosive/high power output movements. Slap shots, wrist shots, snapshots, body checks, skating with the puck or to the puck, high-velocity direction change, fast acceleration/deceleration. I think you’re getting the idea here – this is all very high-intensity stuff and these are all things that can completely change the game. Now knowing this, to logically maximize your hockey specific conditioning, your conditioning workouts should mainly be performed in an alactic-aerobic format (to represent the specificity of the demands of hockey to the context of what’s “conditioning” for hockey players). Taking an Alactic-Aerobic approach is going to better condition you for what you are actually doing on the ice, I can tell you this from a research perspective but also from an experience perspective. Long, low-intensity jogs can have their place in order to build your aerobic base (remember, hockey is an alactic-aerobic sport, so aerobic work is not all bad) — but when they are overemphasized you become an aerobic dominant athlete in a sport that doesn’t reward aerobic dominance. This is not ideal to say the least. Which is why so often these aerobic-dominant players get so much better at jogging, and yet they still completely gas out in the 3rd period and/or are not the fastest players on the ice. This is a perfect example of the good old “more is not better” ideology. 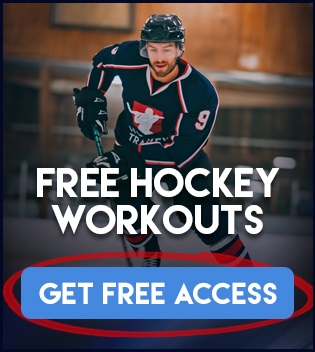 Aerobic work does need to be included in your hockey conditioning training as I talk about in this article, but it shouldn’t be the focus dominant focus. Once you have an aerobic base, it becomes more advantageous for the hockey athlete to decrease their aerobic workout frequency (not eliminate it, just decrease it) and focus more on alactic power (being maximally explosive) and alactic capacity (being able to repeat those explosive efforts without a drop in performance) as these will have a more thorough carryover to the ice. The alactic component of your conditioning workout should come from high-power movements such as various forms of vertical and horizontal jumps, medicine ball throws, explosive kettlebell work, sled pulls and pushes, prowler pulls and pushes, all types sprint variations, etc. The goal for the long-term is to increase your alactic power and your alactic capacity, which is both your peak power output and the length of time you are able to perform this type of explosive movement. Or, to put it another way, how explosive you will be out on the ice, and how long you are going to be able to remain explosive during your shifts. Your aerobic base, on the other hand, is what is going to help increase your recovery rate between shifts while waiting on the bench. See how this all starts tying together, but there are still clear rules to follow for the context of hockey? This is what real specialized training is all about. Of particular importance, to improve your alactic capacity over time, you need to either increase the amount of work performed in your conditioning session while still getting it done at the same time, or, keep the amount of work the same in your workout but get it done in less time. For example, moving your rest periods from 30 seconds to 25 seconds but still performing the same amount of work. This would be an improvement in alactic capacity because you performed more work of the same amount of effort-level in a shorter time frame. Creating a “denser” workout. The goal for hockey conditioning should always be alactic-aerobic based and you should always be performing high-power output exercises and coupling them with incomplete (short) rest periods. As a general rule, if you want to train speed, you use these high-power exercises but use very long rest periods to allow for full recovery. But for conditioning, you want to use a similar exercise selection but decrease the rest period length to force you to perform in a state of fatigue — which is what drives the adaptations in your body to enhance work capacity. 1. It is pointless to work on your alactic capacity if you are not a powerful person first. 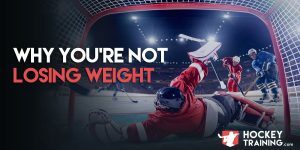 Making sure you are following a strength training program designed for hockey performance is of the utmost importance as it will increase your strength and power output. There is no sense in working on the capacity you can maintain your power at if you have no power in the first place. Nobody cares how many times you can repeat a 6 second 40 run, because you will be watching your team play from the bleachers anyhow. This is also comparable to the guy on your team who brags that he can do 20 chin-ups, but he’s also 130 pounds — not very relevant or impressive, you will still get annihilated on the ice. 2. Nutrition is a big part of conditioning. If you aren’t properly fueled it doesn’t matter what your potential is because you won’t have gas in the tank. It will stop you in your track 10 times out of 10. Nutrition is a component that cannot be overlooked in any area of hockey performance. 3. Performing long, steady-state aerobic work for extremely extended periods of time to build “mental toughness” is completely stupid and counterproductive to your hockey performance. You’re either tough enough to play hockey or you’re not, the weak ones get phased out early in life when the tough gets going. Aerobic work should be done with a purpose and not just to send a message to players. 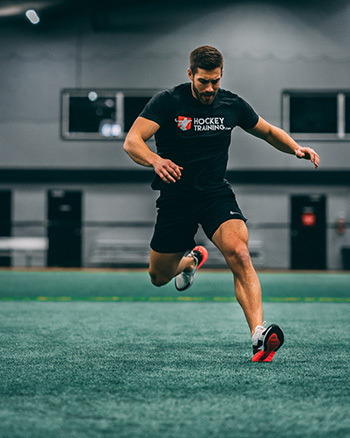 Hockey conditioning training is a big part of our off-season training program found here: hockey training programs, but if you are looking for a hockey conditioning focused program check out our Next Level Conditioning 2.0 Program here. 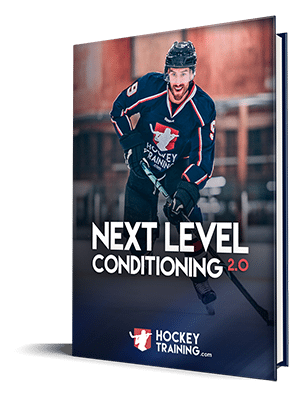 Next Level Conditioning 2.0 includes a full 3-phase conditioning program that will provide you with exact workouts to follow (including video demonstrations of each exercise, so you know exactly how to do each), training manuals that will teach more about proper hockey conditioning, limited space conditioning workouts for the times when you don’t have a lot of space to train, team or partner hockey conditioning workouts, and lots more! To learn more about the program and to get signed up today click here! I have the conditioning program and I love it. But I was reading it for Phase 5 and getting ready to do it and I am not sure I have been doing it correctly. for wave 4, its says “choose three of the following and perform three sessions per week.” Does that mean Lets say I do it Mon, Wed, Fri. Each day I should do 3 workouts? or just 1 workout, each of those three days? Hey Tyler, just one workout three time a week! Just trying to clarify, as I am still confused. So in Wave 4 of conditioning. It says “Choose three of the following and perform three sessions per week:”. So I choose Workout 1, Workout 2 and Workout 3. Do I perform Workout 1 on Mon, Workout 2 on Wed and Workout 3 on Friday for example? or do I do workouts 1,2 and 3 on each Mon, Wed, Fri. I mean the workouts as they are stated in the conditioning pdf not workout in the global terms of workout. I am probably vastly overthinking it. loving the lower body workout!!!! !